In the summer of 1819, Franz Schubert stayed in the Austrian town of Steyr where he began work on the composition of the five-movement Piano Quintet in A major, op. 114 (D 667) which was commissioned by the cellist Sylvester Paumgartner. 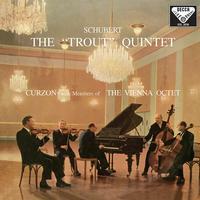 The work was completed in the autumn and soon achieved great popularity under the name of Trout Quintet, which it owes to the Andantino fourth movement — a set of variations on the song of the same name. The work has remained highly popular right up to the present day and so it comes as no surprise to find this highly praised recording, made with such renowned artists as the pianist Clifford Curzon, the violinist Willi Boskovsky and other members of the Vienna Octet, being reissued. The ensemble's refreshing performance reflects the sparkling lightness and virtuosity of the work. The well-balanced recording with its full tone certainly deserves a place in every music lovers collection.